Try this dish with Better Than Bouillon Premium, Reduced Sodium or Organic Roasted Chicken Base. Add the oil to a large sauté pan over medium high heat. Add the onions and cook for 3 minutes. Add the garlic, roasted peppers, black beans, corn, tomatoes and Vegetarian No Chicken Base. Let cook for 5 minutes. Add cilantro and stir to combine. 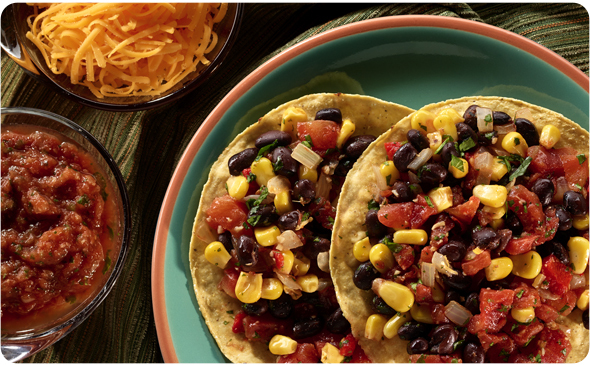 Scoop ¼ cup of filling on a corn tostada and serve immediately. Add the tomato paste, water, cumin and Vegetarian No Chicken Base to a small saucepan. Stir to combine. Simmer for 8 minutes. Sprinkle with cheddar cheese and place on a baking sheet. Repeat with the remaining tostadas. Place baking sheet in oven and let cheese melt for 2 minutes. Drizzle the sauce over the tostadas and serve immediately.